Essentially, grease the groove refers to practicing a technical skill very frequently outside of your normal workouts. You might practice a few reps every day, but most grease the groove approaches involve practicing a few reps many times each day. This approach allows you to improve your technical proficiency very quickly. Keep in mind that these little practice sessions are not supposed to be full-on workouts. They should only involve doing a few repetitions or moving for a moment or two. The goal isn’t to fatigue and exhausts yourself, but rather to stay fresh so the high-frequency training doesn’t require a lot of recovery. 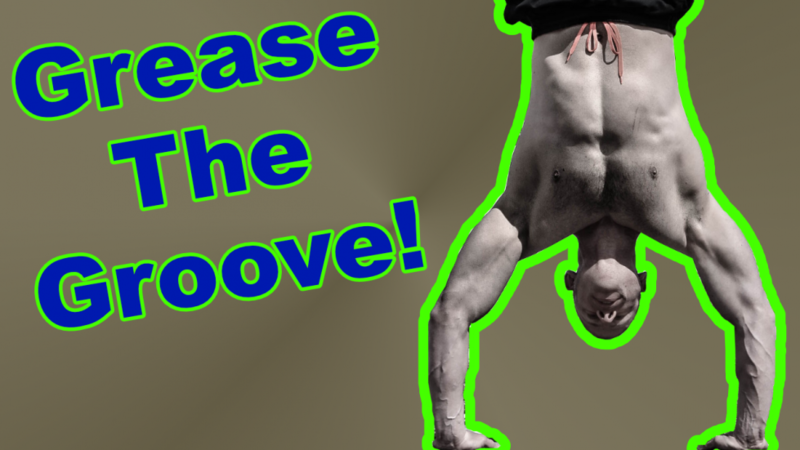 Greasing the groove can be exceptionally helpful for helping you build muscle and strength because it improves your technical proficiency in basic exercises. Your ability to get bigger and stronger will always depend on how technically proficient you are. It’s very hard to get stronger with basic moves, like push-ups, if you physically and mentally struggle with performing that exercise. It’s not unlike learning any other skill in life. Think back your basic lessons in school. You couldn’t perform high-level math equations until you learned your multiplication tables. You would practice your basic math skills almost every day. After a while, the skills that you found challenging became much easier. You could then move onto more advanced lessons. Building muscle and strength is the same process. You have to become proficient and comfortable with technical exercises like pull-ups and lunges before you can really push your muscles hard enough to make them bigger and stronger. It can be very difficult to adequately practice those exercises when you only do them once or twice a week for a few sets. Getting more frequent daily practice increases the overall training volume without a lot of fatigue so your technical proficiency can improve much faster and build your foundation. Grease the groove is a not supposed to be a very long-term approach. It’s only meant to be a short term booster to improve your technical proficiency. Once you become more comfortable with the exercise you can downshift into more of a maintenance mode and practice it less often. It’s just like how you don’t need to practice your multiplication tables every day to remember that 5×5 = 25. You’ve already put in the work to memorize how to multiply so maintaining your skill doesn’t require nearly as much work. Also, consider that your improvement will happen a lot faster if you focus on trying to improve some technical aspect of the exercise with each rep. Don’t just put in a bunch of reps each day and hope to get better. Instead, approach each exercise thinking about what you’re trying to improve on to make those mini-sessions more effective. Lastly, don’t worry too much about making grease the groove a structured program or routine. Some of the best results come from playfully practicing the repetitions when you can instead of trying to perform a specific number of reps each day.